From Goodreads. This electrifying new trilogy blends the best of paranormal and dystopian storytelling in a world where the war is over. And the vampires won. Humans huddle in their walled cities, supplying blood in exchange for safety. But not even that is guaranteed. Dawn has lost her entire family and now reluctantly serves as the delegate to Lord Valentine, the most powerful vampire for miles. 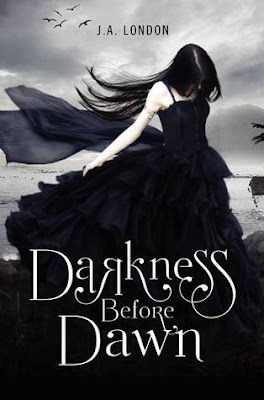 It isn’t until she meets Victor, Valentine’s son, that she realizes not all vampires are monsters.... Darkness Before Dawn is a fresh new story with captivating characters, unexpected plot twists, a fascinating setting, and a compelling voice. Written under the name J. A. London by a talented mother-son team, the trilogy is perfect for fans of True Blood and the House of Night and Morganville Vampires series. If you read the synopsis above you’ll see it compared to the House of Night series and let me tell you right now this is nothing like the HON series at all! This is soo much better! I was a little scared to read this actually because it’s a dystopian vampire story and I just read Julie Kagawa’s The Immortal Rules and I was worried I’d be comparing the two the whole time. There are some faint similarities but Darkness Before Dawn was a really good read! The MC Dawn has been put thru the ringer losing her family and now she has this job she doesn’t want. I mean who would want to work with the very things that killed your family? But she doesn’t have a choice and I like that she has an inner strength and that she’s pretty rebellious. In the beginning I really liked both of the love interests (yep it’s a love triangle but no insta –love thank goodness) but by the end of the book I was definitely in love with Victor gorgeous, tall, dark, mysterious, piercing blue eyes, loves old musicals, loyal, and vampire what’s not to love hehe. There were some things that were pretty predictable but overall I enjoyed the story and I’m very much looking forward to the second book! I chose a passage between Dawn and Victor. The lights are out, but a little moonlight is coming in through the balcony doors. It creates a safe haven for the sharing of secrets. “Tell me a story. It’ll help me go to sleep,” I say. Or maybe he’s just too kind to tell me. Because he also told me that things between vampires and humans never end well. Add Darkness Before Dawn to your Goodreads shelves. Glad to see you enjoyed this one. For me it was just ok. Not sure if it's because I read it right after finishing Sweet Evil which you know I loved! :) The last couple lines of the book pissed me off too. lol. Lol we all loved Sweet Evil Deb and yeah I probably would have had a completely different mindset if I had read this right after. And yeah the last part was like woah! So I'm just going to come out and say it. I loved this book. I loved everything about it: the characters, the plot, the dangerous world...everything. This book was action packed, with some great romance and some awesome characters! I definitely recommend this book to all you dystopian and vampire lovers out there!